We bake seven days a week at The Market at Park City, using old world techniques by leavening our breads with natural starters, also known as long fermentation. 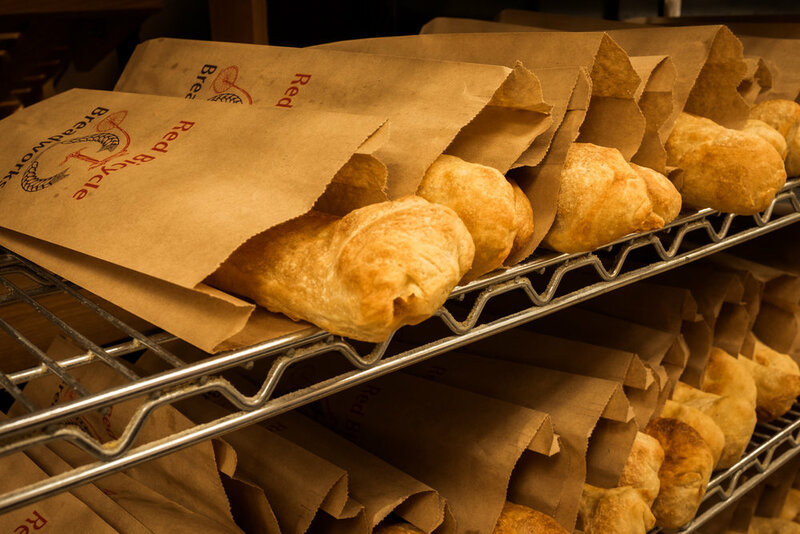 We produce a limited amount of bread each day by hand, first come, first served. Stick Breads are ready at 10:30 am daily; all other breads ready at noon. Please note: Most of our products sell out before the end of the day! Our menu is subject to change and variation. Affectionately called "crack bread" by our locals, this bread gets it's signature buttered popcorn flavor from multiple bastings of olive oil and sea salt. A blend of organic flours, Redmond salt, sourdough starter, and long fermentation give this bread a flavor unique to Park City. This naturally leavened beauty is made with a high percentage of organic whole grains, long fermentation, Redmond salt, and a starter from Italy propagated over 100 years ago. We like to think this bread reflects the true character of our company. Keep PC Crusty! As we like to say. This baguette may be crustier and chewier than a traditional one as it is 100% naturally leavened. Made with a blend of organic flours, Redmond salt, and our Italian starter, the complexity of flavor achieved with so few ingredients has made it a favorite at Red Bicycle. This bread is not made with a traditional flour. Instead, the sprouted wheat berries are ground into a paste. This combined with organic nine grain, sea salt, honey and molasses make for a deliciously soft sandwich loaf. Another baker's favorite, this seeded Sourdough contains sprouted whole wheat, cacao nibs, and dried cranberries. All known to be great sources of magnesium. This whole grain wonder has a beautiful sweetness and slight nuttiness from quinoa which we sprout in house to make the nutrients from these grains more digestible. This bread is a little something sweet. Made with Salt Lake City's own Publik Coffee and bittersweet chocolate chips for a unique Pain Au Chocolate. Made with beer soaked jalapeños from the Wasatch Brewery and goat cheese from Shepard's in Erda, Utah. This bread has an interesting jalapeño popper flavor. This bread is unique for its olive oil, herb flavors, and open crumb. Our thin sourdough crust made with long fermentation, is the perfect base for a variety of simple, fresh toppings.. Preheat oven to 400˚F and bake for 6 minutes. Done & done.